Two children died after they opened the zippers of an Ace Bayou bean bag chair , crawled inside the chair’s foam bed and got trapped. They suffocated from the lack of air and inhaled the foam beads. 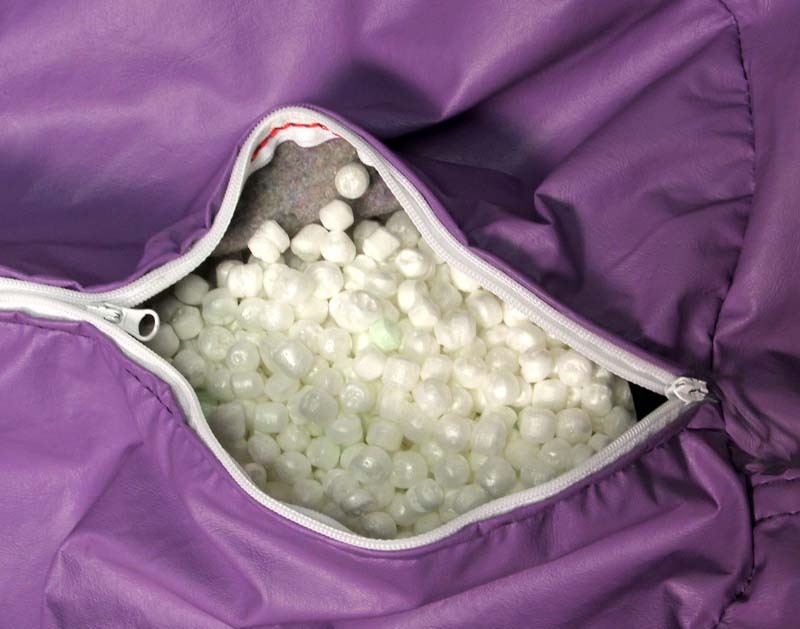 The voluntary standard requires non-refillable bean bag chairs to have closed and permanently disabled zippers. The Ace Bayou Bean Bag Chairs don’t comply with this standard. The recalled products have two zippers, one on the exterior cover and one underneath on the bean bag itself. Both can be easily opened by children who can then crawl inside and get trapped. For over a decade, GM knowingly kept 2.6 million defective cars on the road killing and injuring an untold numbers of road users. 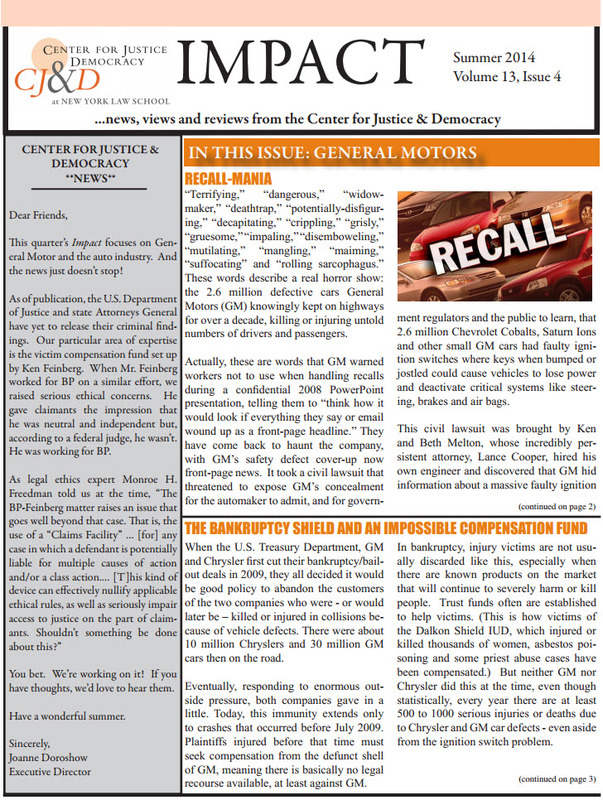 From the civil lawsuit brought by personal injury lawyer Lance Cooper who discovered that GM hid information about the defective ignition switch to the multiple recalls of 2014, Impact Magazine, the quarterly issue from the Center for Justice and Democracy focuses on General Motors’ product liability. The magazine looks at the history of the recalls as well as the bankruptcy shield, the issues with used and rented cars and also questions the NHTSA stand. 90% of dangerous and defective children products are not being returned or repaired according to a new report by the Children Safety Advocate Group Kids in Danger. Because it takes an average 14 reports of design complaints and two reports of personal injury related to the product for the manufacturer to initiate a recall, some of the products may have been discarded or may not be used anymore by the parents at the date of the recall. However such a high percentage indicates that many dangerous products that have already injured or killed children are still being used by parents that are unaware of the recall. According to the report, in 2012, 584 incidents and 39 personal injuries were reported after a juvenile product was recalled. These numbers demonstrate that manufacturers and the Consumer Product Safety Commission have to find a way to better communicate recalls to consumers. The report also shows that social media is a very effective way to communicate recalls but is not used enough by manufacturers. Parents also have to be responsible and fill out the product registration card for all juveniles products so that the manufacturer can automatically reach out to them in case of a product recall or any other safety issue. Unfortunately only 30% of parents fill out the registration card for juvenile products. The defective stents may cause serious personal injury such as complications of bleeding, loss of limb, heart attack (myocardial infarction), stroke, vascular surgery, and/or death if they fail to deploy properly. The LifeStent Solo Vascular Stent manufactured by Bard Peripheral Vascular is an implantable self-expanding stent and delivery system used to improve the inner open space of a blood vessel in patients who have lesions caused by abnormal narrowing of the affected blood vessel.